Finian Road Image & Design • The Blog: Just in time for Valentine's Day! Just in time for the sweetest day - save a sweet $50 on a Finian Road shoot for your family! If you are looking to give a gift of family images (or looking to receive one from your sweetheart! 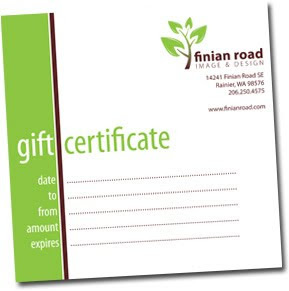 ), here's your chance...give a Finian Road photo shoot and pay just $400! Now through February 14th, all gift certificate purchases are $50 off the regular price of $450. Orders made by noon Pacific time on February 11th can be guaranteed to arrive by the 13th in time to give on Valentine's Day. Your gift certificate will arrived wrapped and ready to give. This will be the only special savings this spring on shoots -- so if you are looking to book a shoot, why not lock in the savings now? All orders placed by February 14th will receive a bonus 16x20 print, on metallic photographic paper to be chosen after the shoot. A great way to highlight your favorite image! It's simple to buy online, right now: your gift certificate will ship within 12 hours!